This workshop was conducted in October 2018 in the Media Suite at Loftus Road which is the stadium of Queens Park Rangers F.C. 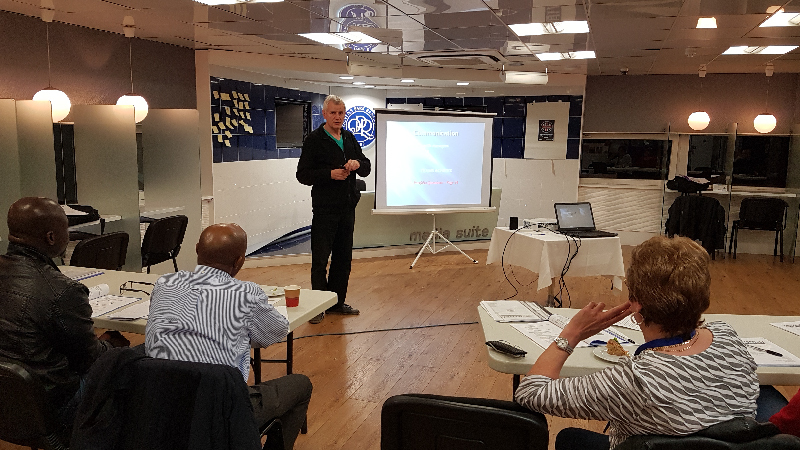 The session was run by the stadium’s Deputy Safety Officer, Alex Fish, a retired policeman who spent 30+ years in the Met Police before moving onto event security. The workshop was aimed at learners wishing to gain the NVQ Level 2 in Spectator Safety and was attended by 12 learners (we can cater up to 25 learners at one sitting) and introduced them all to the role, its responsibilities and relevant case studies which relate to the role itself. STA Limited will always strive to give your staff access to live, hands-on assessors and tutors who are either incumbent Safety Officers or professionals within this field. If you would like to have your staff trained to NVQ Level 2 standards in Spectator Safety then please get in contact with us via the details on the ‘Contact us’ section of our website.